There was public outrage following the vicious stabbing of a pregnant woman and an elderly man on August second, 2010. Twenty-eight year old Valerie Sheran and seventy year old Ernesto Ireland survived the attack, but her unborn child was killed. 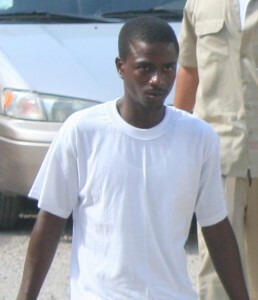 The stabbing was believed to be triggered by jealousy; days later, Sheran’s ex-boyfriend, Henry Patnett, handed himself over to police and was charged with Attempted Murder, Wounding and Child Destruction. The trial started before Justice Adolph Lucas today, but after Prosecutor Meagan Francis called three witnesses to testify against him, Patnett asked Justice Lucas to stop the proceedings and allow him time to seek legal representation. His request was granted, the nine member jury was discharged and the case is now set tentatively for June fourth. On the night of the heinous crime, Sheran and Ireland were sleeping when Patnett, enraged because his ex had found a new lover, allegedly went to her house on Neal’s Pen Road. Reports are that he knocked on the door and a child opened it, thinking it was someone who lived there. And while Sheran’s mother, brother and other relatives were also asleep, Patnett headed to her bedroom where he allegedly stabbed her multiple times to the abdomen, killing his own unborn child. In his jealous rage, Patnett also reportedly attacked Ireland. He was granted bail today, but was unable to meet it, so tonight he remains behind bars. Little man-we know why you may be mad for her other selections-but how can you live with yourself to kill your own child-your embarrassment and regret will be with you for the rest of your life. This is why we need THE PRISON FARM…SUSTAINABLE REHABILITATION CENTER. They should really do something about people who commit crimes like this, but with the way Belize is going now, he’ll probably get off easy.